Thank you to Lenka Cathersides and Wendy Shuttleworth for the following research. 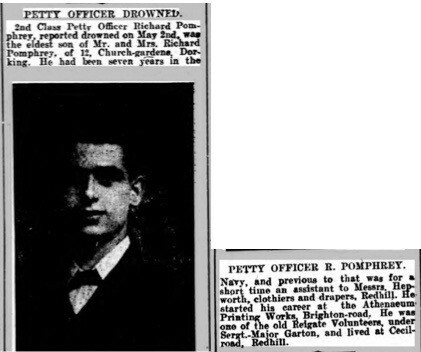 Richard Francis Pomphrey was born on the 23rd of February 1894 in Caterham, Surrey to Richard and Annie Ada Pomphrey nee LaRondie and was baptised on the 6th of May 1894 at St Mary’s church in Reigate, Surrey. At the time of his baptism the family lived in Caterham and Richard was working as a shoemaker. At the time of the 1901 Census, the family lived at Colin Road in Caterham. Richard was still working as a bootmaker and Annie was looking after their children: Richard Francis, Louisa, Alice and Dorothy. On the 16th of August 1910 Richard became a Cadet in the Royal Navy. He was a Boy Servant and his service number was L/2143. The first ship he served on was from the 16th of August 1910 HMS Pembroke I. He had a fresh complexion, brown hair and grey eyes. He had an image of a heart and clasped hands with the words “True Love” tattooed on his right forearm. Prior to his service he was working as a shop boy. 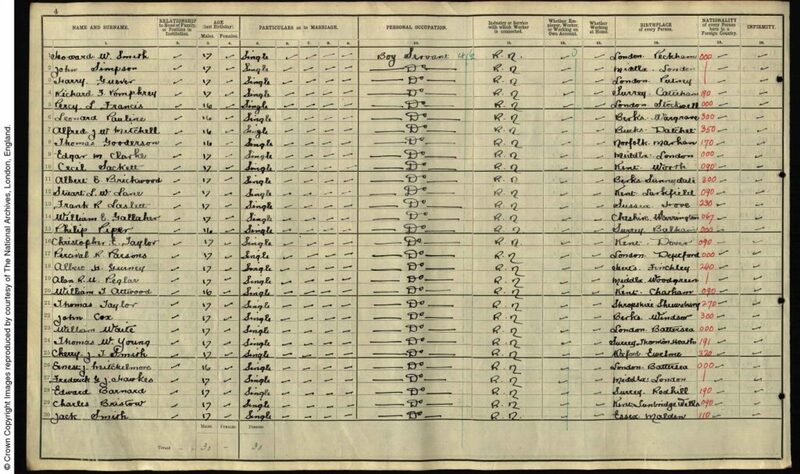 At the time of the 1911 Census, Richard was a Boy Servant in the Royal Army stationed in Chatham, Kent. 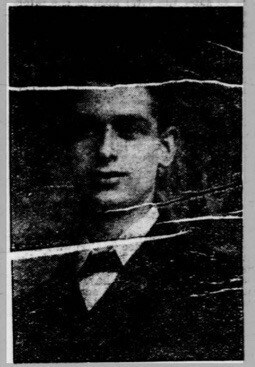 Richard Francis was transferred on the 20th of June 1913 into the Royal Navy in Chatham for duration of 12 years. The first ship he served on after his transfer was HMS Pembroke I: from the 20th of June 1913 to the 30th of July 1914. At the time of his death he was a Cook’s Mate with the service number M/6140 (Ch). 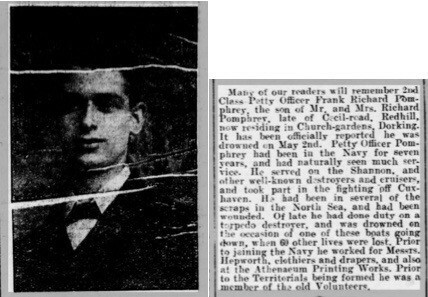 Richard Francis Pomphrey drowned on the 2nd of May 1917 while serving on HMS Derwent. The ship struck a mine and sank in the English Channel. He is commemorated on the Chatham Naval Memorial on panel 25. In 1917 Richard’s parents lived at 12 Church Gardens in Dorking. Richard’s father Richard Pomphrey was born in the 3rd quarter of 1866 in Reigate, Surrey to labourer and gardener John Pomphrey, born about 1820 in Kent, and Louisa Pomphrey, born about 1829 in Sussex. His mother Annie Ada LaRondie was born in the 4th quarter of 1867 in Aldershot, Hampshire to tailor Francis LaRondie, born about 1828 in Boulogne, France and Mary Ann LaRondie, born about 1829 in Somerset. Annie was baptised on the 3rd of May 1868 at St Michael the Archangel’s church in Aldershot. Richard and Annie married, by Banns, on the 29th of April 1893 at St Mary’s church in Reigate. At the time of their marriage the couple lived in Reigate and Richard was working as a boot maker. Richard Francis had seven siblings: Louisa born about 1896; Alice born about 1898; Dorothy born about 1900; Rose born about 1902, all in Caterham, Surrey; Nelly born about 1905 and Hilda born about 1907 in Reigate and Charles born about 1909 in Redhill, Surrey. At the time of the 1911 Census, Richard’s parents lived at 12 Church Street in Dorking. Richard was working as a boot repairer and Annie was at home. 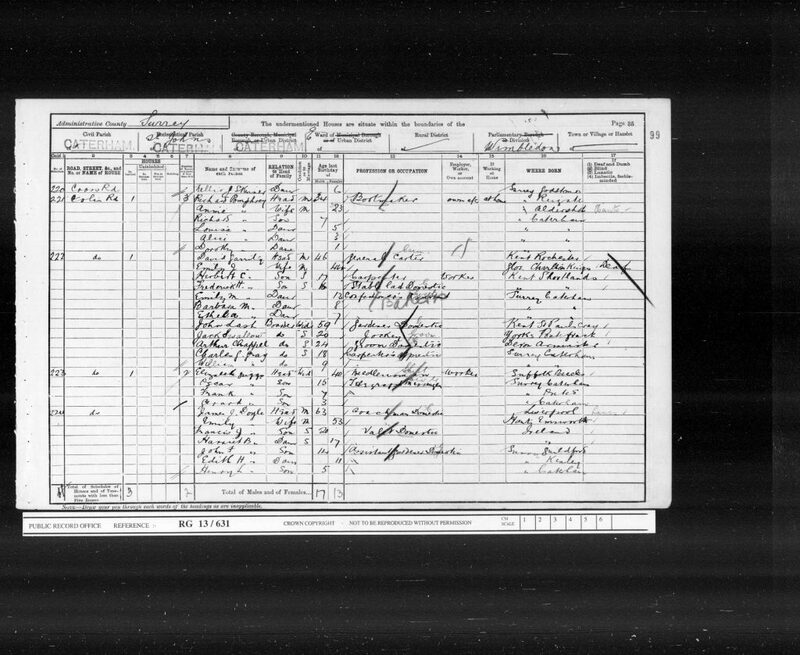 The household further comprised of their children: Louisa, Alice, Dorothy, Rose, Nelly, Hilda and Charles. Annie stated that she had given birth to eight children. The accommodation had five rooms.